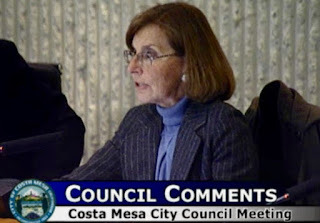 Yesterday Marcie Frost, since July the Chief Executive Officer of CalPERS, the biggest public employee retirement system in the country, issued a commentary explaining the rationale behind the decision by the CalPERS Board last month to reduce the "discount rate" by a half percentage point over the next three years. 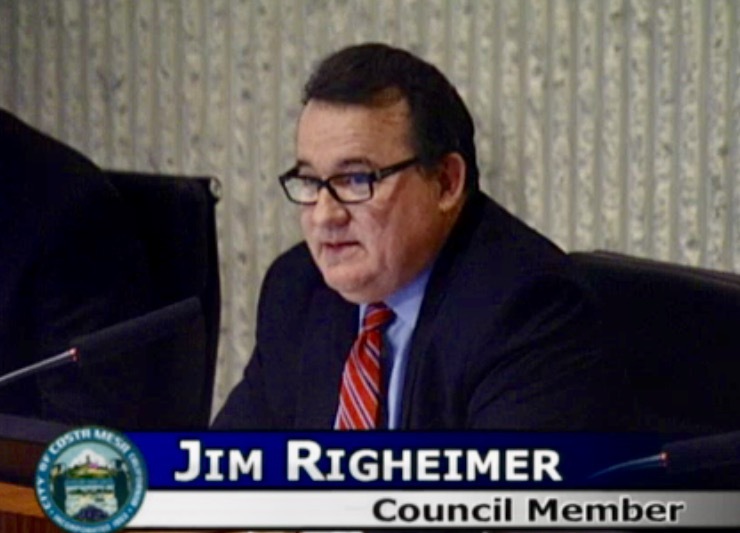 Regardless how you feel about public pensions - we know how Jim Righeimer feels, since he told us in no uncertain terms EXACTLY how he feels at the most recent City Council meeting when he said, "I will say this uncategorically, nobody, nobody who works in government should have a $200,000 pension check - period!" - and whether we should somehow go back on the contractual agreement we have with our employees covered by this plan, we cannot duck the reality of this issue. Yes, a reduction of the discount rate means that member agencies, like the City of Costa Mesa, will have to make up the difference, which will increase the amount of the Unfunded Pension Liability - estimated by some to be right at $229 million today. 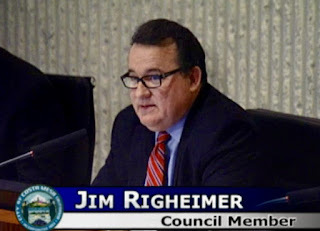 Although neighboring cities have begun to chip away at their pension liability, so far the City of Costa Mesa - under the dictatorial leadership of Jim Righeimer - has done virtually nothing to reduce it. Quite honestly, due to the circumstances beyond the control of the city, there seems to be not much that CAN be done short of Municipal Bankruptcy. The Pension Oversight Committee, early in their tenure, heard all about that option from a workshop conducted by one of their members. 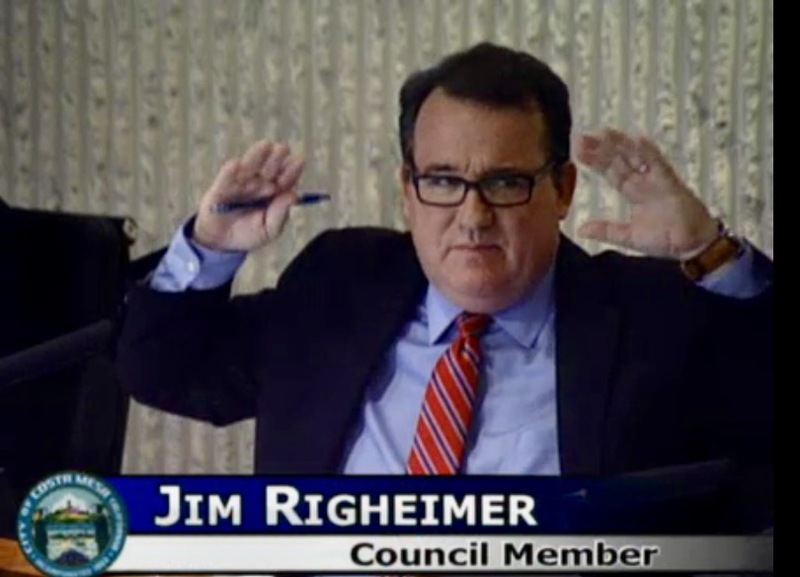 Righeimer, whose hatred for public employees and his envy for their pensions oozes from his pores as he speaks about it, implied that he wants the employees to give back their benefits - to agree to take a lesser amount to soften the impact of the pension hit on the city coffers. Here's the text of Frost's commentary, found in it's original format at this link. Last month, the CalPERS Board of Administration took a decisive step to strengthen our fund by cutting what is known as the "discount rate" by a half percentage point over the next three years. The move generated a lot of attention. Some praised it. Some complained that we didn't make a deeper cut. Others were considerably harsher. They charged that we had hid our 4-year-old policy, one that was very publicly debated in 2013 (PDF), of implementing any reduction over five years. Of course, that's just straight-out wrong. 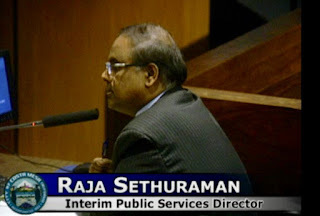 I took over as the Chief Executive Officer of the California Public Employees' Retirement System last October. I believe deeply that all of us, private and public sector workers alike, deserve financial security in our retirement. Let me explain why cutting the discount rate is so important - and let me tell you about our goals and our future and why we won't shy away from tackling the pension challenges ahead. First, some background: The discount rate is what we assume our $304 billion in investments will return in a typical fiscal year, July 1 to June 30. It's a critical component of pension financial planning, because it’s used in calculating the amount of money those who are part of the CalPERS system contribute. We lowered the rate because experts inside and outside CalPERS advised us that, the recent stock market surge notwithstanding, the long-term financial outlook had darkened. Achieving a 7.5 percent return – the rate in place since 2012 – was now far less likely than it was just two years ago when we last revisited it. Solid investment returns are the cornerstone of the CalPERS system: They pay for nearly two-thirds of every dollar we pay out in pension benefits. But cutting the discount rate has real financial impacts for California taxpayers. We're acutely aware of that. The state, local public agencies, and school districts that make up CalPERS will have to contribute more money. So will many public employees, especially those hired after the Public Employees' Pension Reform Act took effect in January 2013. Liabilities too will grow before they level off and begin a downward trend. Those hard realities helped inform the CalPERS Board when it decided to reduce the rate over three years - to 7.375 percent immediately, to 7.25 in July 2018, and, finally, to 7 a year later. To sustain the CalPERS Fund for decades to come and pay the benefits they've promised their employees, our 3,000 employer partners knew the discount rate had to be reduced. But it was abundantly clear from our many conversations with them that they wanted to see the changes phased in. For their own budgeting purposes, they didn't want the rate to be cut dramatically in one fell swoop. The reduction is a key step to ensuring the long-term sustainability of the fund and keeping in place reasonable retirement benefits that public employers need as they compete in the marketplace for talented workers. Others recognize the benefits of the decision as well. The credit-rating agency Moody's has called it a "credit positive" (PDF) for the State of California and many local governments. We are a maturing pension fund like many across our nation. More money is going out in pensions than coming in, we have a low funded status, a decline in the number of active workers supporting retirees, and a low-return investing environment. These issues are real, but we are on the right path to full funding - and the Board's action on the discount rate has strengthened our efforts. We've just started a comprehensive review of our assets and liabilities to make sure we're invested in the right places as we continue to pay the benefits our members have earned. We're working overtime to provide the public agencies and school districts with the clear financial roadmap they need to properly plan their budgets over several years. It will take time, but we have the discipline, confidence and the financial expertise to solve these issues for the next generation of public servants. The real difficulty about this debate is not simply the data before us. It's the clear understanding that what we do impacts real lives - the lives of our 1.8 million members, the bottom line of the cities, counties, schools, and special districts that are the backbone of California, and, ultimately, the taxpayers of our state. CalPERS is celebrating its 85th anniversary this year of serving those who serve California. We intend to directly confront what's ahead so that we can provide retirement security for the next 85. 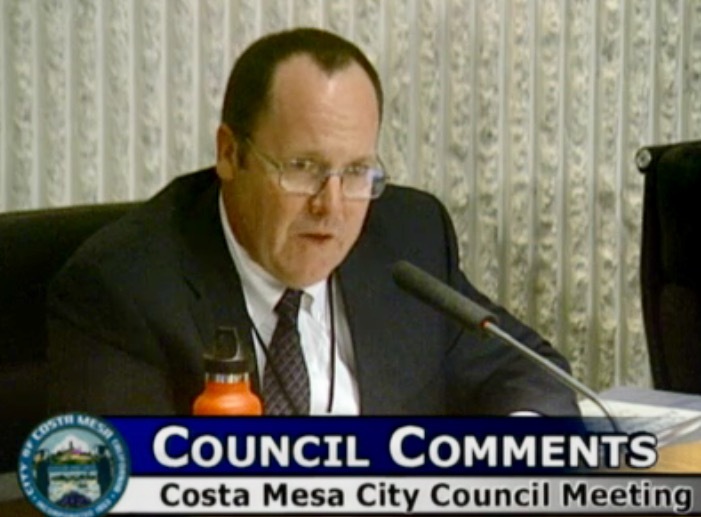 The City of Costa Mesa re-issued the call for volunteers for three city commissions - Planning, Parks & Recreation and Senior - based on the actions of the City Council Tuesday night when they voted, 3-2, to flush out all the existing commissioners and start afresh. You can read the city recruitment announcement HERE. Personally, I think this was a great idea. I agree with the idea that there should be diversity of ideas, backgrounds and locations on the commissions. Recently, in the case of the Planning Commission in particular, it has been populated predominantly by lock-step lemmings, ready to follow every word uttered by the council majority. That's not healthy for the city, as witnessed by things like the Small Lot Ordinance and the proliferation of those ghastly multi-story developments on the Westside. There has been much wringing of hands and gnashing of teeth about the loss of the experience represented by the current commissions. There is nothing to keep existing commissioners from re-applying and I hope some of them do toss their hats in the ring again. I've said before that a couple of the current commissioners should be considered for re-assignment, but certainly not all of them. A few will never shake the stench of their obvious allegiance to the recent past council majority. So, check out the site and, if you have any interest in serving the community in a very important, visible way, file an application. The deadline for submission is Wednesday, January 18th at 5:00 p.m. There will be two special City Council meetings, on January 24th and January 31st at which applicants will be vetted and, probably on the 31st, selected for the commission assignments. The council is looking for a large pool of interested parties, so get those applications filed - you can do it online, fax, mail or hand-deliver to the City Clerk, Brenda Green. Over the Christmas holidays, when City Hall was closed and all was well with the world, I contemplated the future and, out of necessity, also contemplated the past. That contemplation took me back to July 9, 2005, when I first began A Bubbling Cauldron. I was using a bargain-basement blog host at the time, so couldn't use images, nor were commenting capabilities available... it was just me, writing and hoping somebody might read what I wrote. The potential redevelopment of Westside Costa Mesa got a whole lot more interesting recently. On June 23, 2005 the United States Supreme Court ruled in a Connecticut case that eminent domain can be used to force property owners off their land so another entity can replace it to generate more tax revenue. However, the Fifth Amendment of the Constitution states, in part, "nor shall private property be taken for public use, without just compensation". In this case that term, "just compensation", is just another way of saying, "way below market value". If I were a business property owner on the Westside of Costa Mesa I would be shaking in my boots about now. It was bad enough when the residential overlay was approved for the entire area that will permit a willing industrial property owner to sell to a developer and facilitate the integration of residential units in the present industrial area. This recent ruling makes it a whole new ball game. Now eager developers can sweet talk our City Council into using the sledgehammer of eminent domain to oust even the most reluctant of property owners. Do I hear the jingle of campaign finance coins in the air? You're probably saying to yourself, "Nah, our council members would never do that." Well, don't be too sure. It takes lots of money to successfully run for public office. Eric Bever, for example, managed to round up over $50,000 for his war chest in his slim victory last November. He and his pal, Mayor Allan Mansoor, seem likely to run again - Mansoor in 2006 and Bever in 2008 - so developers with jingling pockets will probably start showing up on their doorsteps pretty soon with plans for the "mansionization" of the Westside. 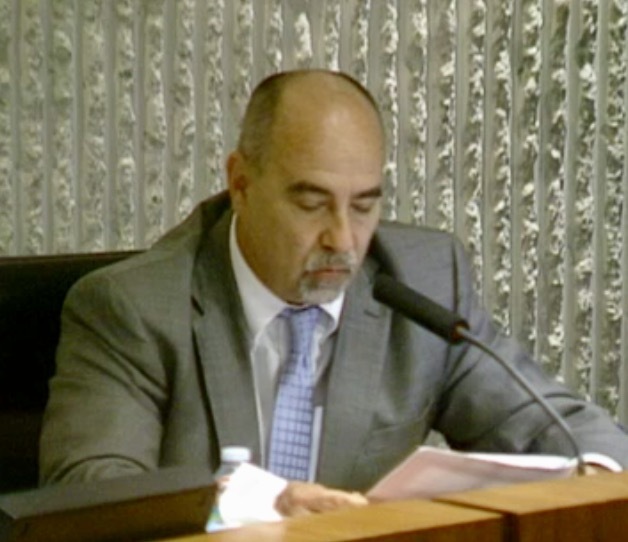 Ambitious Mayor Pro Tem Gary Monahan, who theoretically is termed out of a council seat after his current tour, might be looking forward to higher office - perhaps County Supervisor. I imagine he will have his ear cocked for the sound of jingling coins, too. Lest you think the ladies on the dais will be left out, I suspect Katrina Foley and Linda Dixon can expect the developers to come calling, too. If you're thinking to yourself that this won't affect you, think again. If you own a one of those little, old homes on the Westside in an area that falls under the shroud of the residential overlay, you might be getting a queasy stomach right about now. If you had a cocky smirk on your face a couple months ago when the Westside Redevelopment Oversight Committee's recommendations were usurped by Bever's sleight of hand that put the residential overlay over virtually the entire Westside because you thought it would rid you of obnoxious industrial neighbors, think about this: As I understand this ruling, it would be entirely possible for a residential property owner living in a redevelopment zone to be forced to sell his home for "just compensation" so a new, larger one could be built that would generate more property tax. 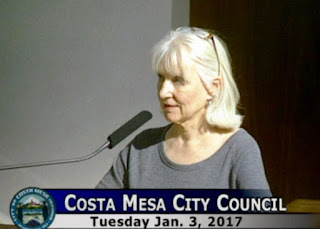 If your little bungalow just happens to sit on a sliver of land that might be a key acquisition for a larger development, we could soon be seeing your taillights as you head out of town, because you sure won't be able to afford another place in Costa Mesa with the proceeds of your "just compensation". Are you nervous yet? You should be - especially in this city, where the ruling troika on the City Council has already demonstrated a smug willingness to play fast and loose with the rules. I, for one, expect to have more than a few sleepless nights about this issue. 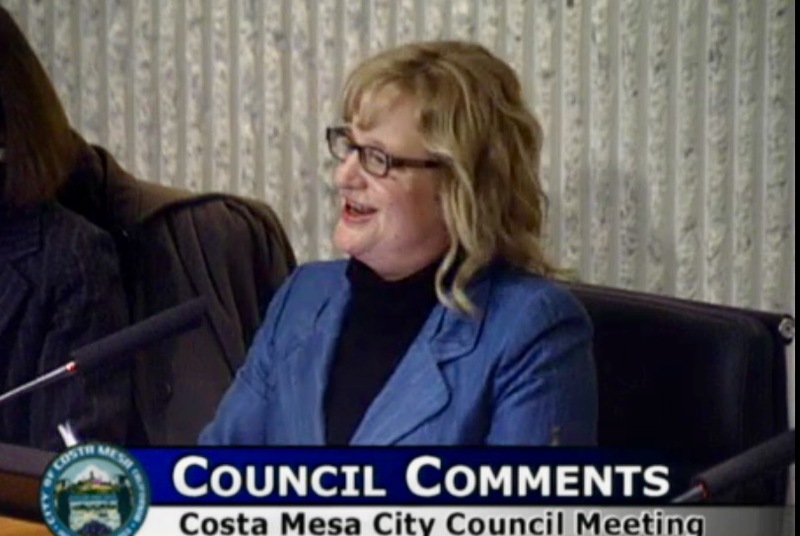 The first Costa Mesa City Council meeting of the year was memorable for many reasons. To read more about what I anticipated about this meeting earlier go HERE. You can watch the streaming video of the meeting HERE. Be sure to use the "jump to" feature below the screen to jump to subjects you may be interested in if you don't want to sit through almost six and a half hours. Before we launch off on the details of the meeting(s), let me cut right to the chase. If you expected this new council configuration to produce harmony on the dais, you were wrong, wrong, wrong. It didn't take long for Jim Righeimer to further demonstrate that he's a lying, maniuplative, conniving, carpetbagging, public employee-hating political hack. We'll talk about that later as we go through this post. MORE MATURE, POLISHED MANSOOR? NAH! 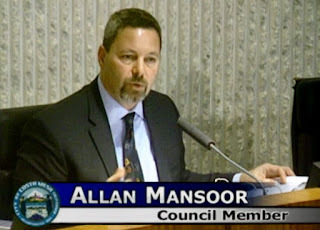 And, if you thought Allan Mansoor's return would present us with a more mature, more polished from his time in Sacramento, less combative and more intelligent presence on the dais, you were wrong again. What we have is an older, but not any smarter, version of what he was before. 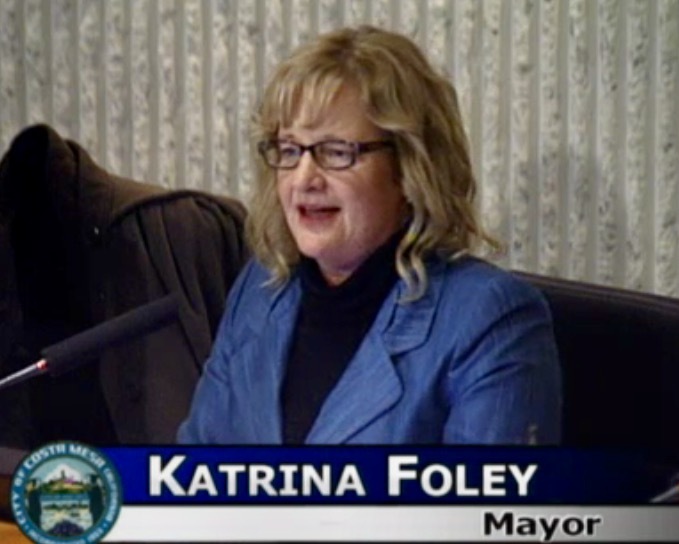 And, he showed us a willingness to engage in disrespectful sparring - an honest-to-God shouting match, for goodness sake - with Mayor Katrina Foley in a return to years past when the two of them jousted on the dais at almost every meeting. So, as the proliferation of 3-2 votes last night demonstrated, it's going to be a very contentious couple of years. 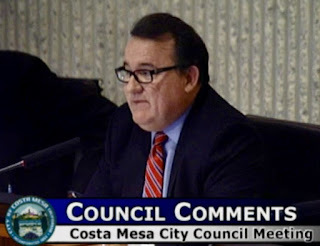 At 3:30 p.m. three of the council members - Mayor Katrina Foley and members John Stephens and Allan Mansoor - met to launch the extraordinary closed session in which an astounding ten (10) items would be addressed. Mayor Pro Tem Sandra Genis arrived 10 minutes later. During Public Comments for the Closed Session a member of the public stepped up and encouraged the council to NOT settle anything with Yellowstone Recovery, one of the issues on the agenda. 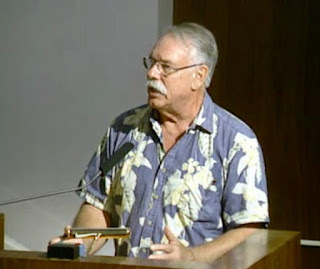 This member of the public is a long-time recovery home watcher and may be the most knowledgeable person in town on this issue. 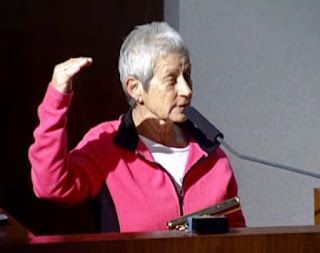 She described the operator of this organization, Dr. Honey, as the "worst operator in the city", and described many examples of why she feels that way, dealing with "curbing" - tossing failed clients out onto the streets with their belongings in plastic bags - was only one example. Genis arrived as City Clerk Brenda Green read the ten items into the agenda, then the four members attending - Jim Righeimer was absent - adjourned to Conference Room 5A for the closed session. 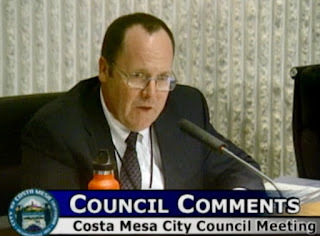 indicating that the City Council provided direction authorizing dismissal of Costa Mesa's pending appeal. The main legal action remains active and will proceed in Superior Court. During Public Comments fourteen (14) people spoke to the council on a variety of issues. 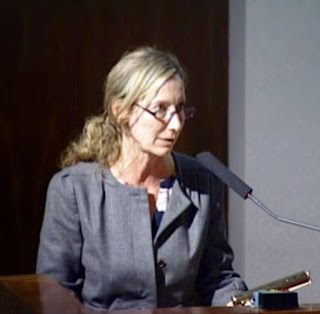 Cindy Black expressed pleasure on the seating of the new council, then reminded everyone that the Banning Ranch issue will be heard today, Wednesday, by the California Supreme Court and will be live streamed beginning at 8:45 a.m. The Banning Ranch issue was to be the first item on the agenda. Gary Parkin reminded the council of the $229 million unfunded pension liability that exists and urges caution when planning on spending money. Sue Lester asked for the council to bring back the idea of an Ethics Policy, which was rejected by previous councils. She cited the need for standards to be established. 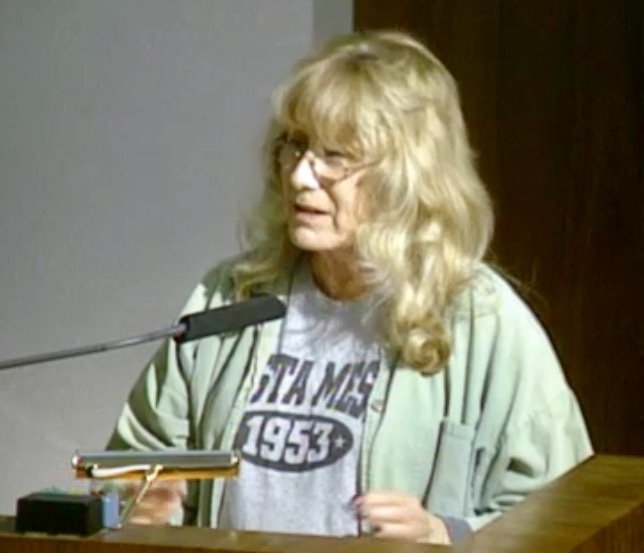 Georgette Quinn spoke to the problem of the incessant dredging in the Santa Ana River near the Westside. It has been interfering with sleep by residents on both sides of the river. Susan Shaw asked that consideration be given to implementing the Rescue Ambulance program, getting rid of CARE Ambulance Service. Wendy Leece reitereated the problem with the the dredging in the Santa Ana River and provided contact numbers. 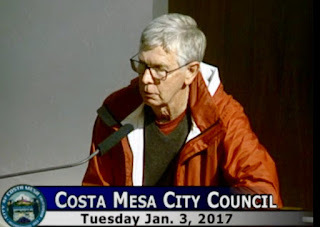 Jay Humphrey addressed John Stephens' plan for illegal fireworks and also told the council about a problem with car carriers blocking sidewalks and bike lanes on Merrimac unloading vehicles during peak "to school" traffic times. He also complained about the lack of the promised "green wall" at the same car dealership - part of the condition of approval given to the dealership for their recent renovation. Mary Spadoni thanked all for their contributions to the custom dog cookies to fund Standing Rock Health Programs. More fundraiser efforts are coming. Robin Leffler thanked the council, observed that speaker cards are valuable to the staff for creation of minutes. She asked for consideration to bring back the ABLE helicopter program and also the acquisition of K9 teams for the CMPD. 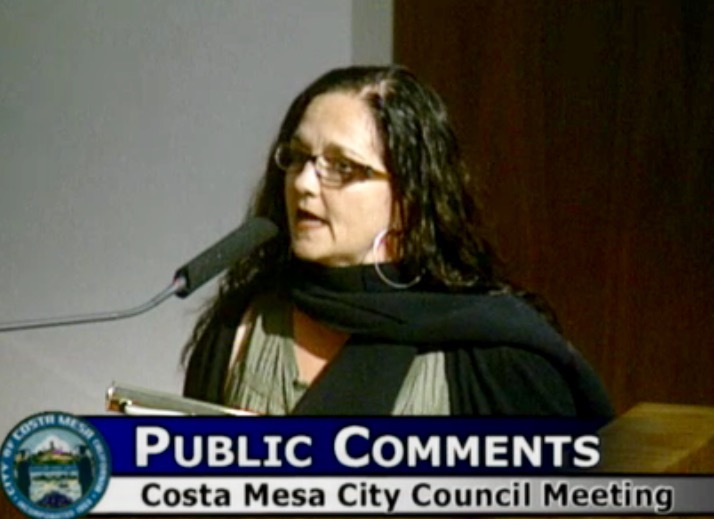 Tamar Goldmann thanked the new council and Foley in particular. She observed that her absence at future meetings should be interpreted as a vote of confidence in their ability to handle the job. She observed a need for an objective study of real parking needs in the city. 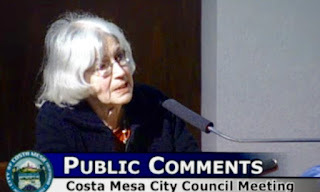 She cited "resident only" parking plans that are damaging the fabric of the community. She also asked for a moratorium on variances, citing the impact of the Small Lot Ordinance. Kark Ahlf spoke on illegal fireworks. 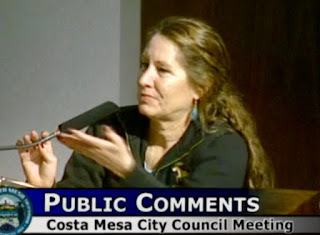 An unidentified person also talked about New Years Resolutions - getting rid of the Small Lot Ordinance, the bogus voting district plan and the need for a moratorium on Sober Living Homes - a legal pause - because she didn't think we knew what we're doing. 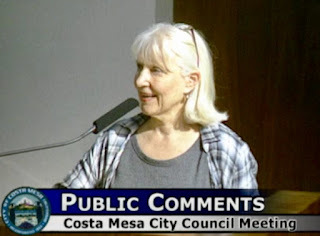 She also asked to have Dr. Phil stop advertising Costa Mesa as a Sober Living haven? 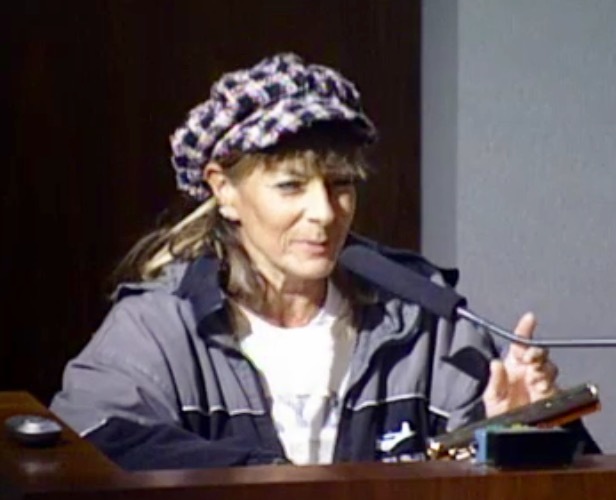 She also referred to Leffler's comment about the K9 Units, citing - with a playful glance at Righeimer - that dogs don't get pensions. Ralph Taboada also addressed finances - the budget surplus and suggested more being allocated to paying down the unfunded pension liability. Recent CalPERS decisions will dramatically increase the City's contribution. He also recommended re-direction of funds from the library fund to Fire Station #1 so it might be totally self-funded. An unidentified person asked for some help for the residents to learn to navigate through the city web site, suggesting coordination with the Senior Center publication, The Chronicle. She cited the need for inclusiveness. Sandy Genis led off the Councilmembers Comments segment. She began by calling for inclusiveness, then addressed Jay Humphrey's concern about car carriers. She also told us that she's planning a workshop on infrastructure - to gather input from the public on what they want to see in the way of needed infrastructure improvements. 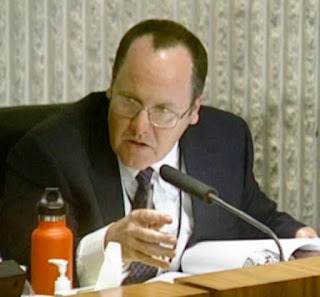 Rookie councilman John Stephens was up next and opened with an observation of the recent article in the Los Angeles Times on the City of El Monte and their pension situation, which was exacerbated and facilitated by a lack of public participation and awareness. 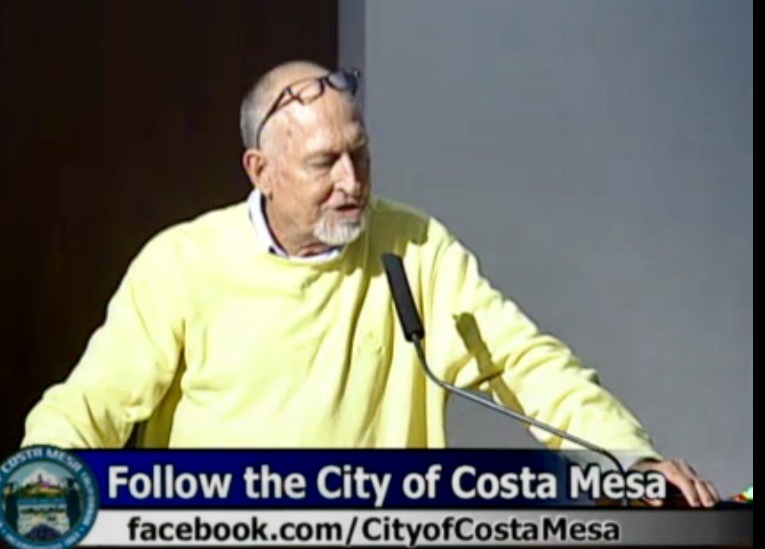 He thanked the audience for their participation, observing that it could never happen that way in Costa Mesa today. He also addressed the illegal fireworks issue, stating that there will soon be a meeting - a public outreach event - to address that very subject. He observed that Snoopy House was awesome, thanked the staff for their efforts. He also asked Hatch about the costs involved in putting that event together. He also spoke about working with our various attorneys to provide more information on on-going and pending litigation. He also expressed interest in a Rose Parade Float. He said he's glad to be here and glad to be working with this new council, but threw cold water on the idea that all the problems will be solved. He mentioned the El Monte article, then launched off onto a screed about our retirees. He observed that our top five retirees get more than $200,000 per year, but his list included some under that number. That's OK... facts don't count with him... only his opinion counts. He told us we have 100 people getting more than $100,000 a year in pensions, and that we have more retirees than we have employees on the payroll. Gee, how odd that a 60 year-old city would have more retirees than employees - especially since he and his gang of marauders have systematically chopped the city staff for the past almost 6 years! What a hypocrite! He then said this city council got elected because the union did a lot of their work to get elected. That drew murmurs from the crowd. He quoted people who "told him" about encounters with firefighters at their doors during the campaign who "basically said you're not safe". In response to the comment above about the K9 unit not getting a pension, he launched into a screed about the handler getting more money for managing the dog and that money is pensionable. He then told us that libraries are not a problem because we have a big budget and we can afford those kind of things. No, he told us, the problem is full time employees that have pensions we cannot afford. He said it won't get solved by throwing a few million here and a few million there at the problem. He said we need to get everybody in a room, including the people getting the checks, to discuss it, otherwise it won't get solved. He said, "I will say this uncategorically, nobody, nobody who works in government should have a $200.000 pension check - period!" He reminds me of those kids in junior high school who would look around the shower room enviously thinking, "Gee, I wish mine was like that!" The man has a serious case of pension envy! Mansoor was up next. He thanked everyone for coming out. He asked Hatch to check on the dredging issue brought up earlier and the car carrier issue. He offered to meet with anybody if they have problems navigating City Hall. He also addressed the Pension issue. He told folks they can do their own research. He said he's glad he's able to respond directly to your comments right after you make them instead of you having to wait three or four hours. Foley welcomed everyone, addressed the speaker cards - optional use. She also said they're going to try to reserve the front row for folks who wish to speak during Public Comments. She thanked the speakers for their respectful communication and looked forward to more. She thanked the staff involved for the Snoopy House effort again this year. She asked for suggestions for how to make Snoopy House better in the future. She mentioned that we're going to be seeing a record year at South Coast Plaza this year - great for the city because of the sales tax revenue generated by that venue. She also mentioned the recent announcement that the San Diego Chargers may be relocating to Costa Mesa. We may know about that in a couple weeks. 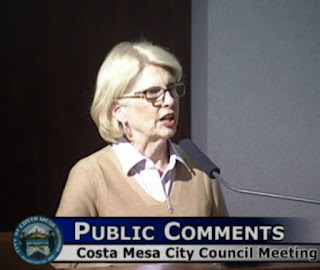 She also commented that the "Transport Model" - the full utilization of the Rescue Ambulances - will be coming back to the council for consideration in the near future. She apologized for the late start, indicating the large volume of items before the council now and during the rest of January. She said "We'll be here every Tuesday night for the month of January." Hatch had no particular items to discuss during his time on the agenda, except to observe that his office has been working closely with the council members to determine their goals and dreams. He also mentioned a new "tracking sheet", to help coordinate things that will take significant amounts of staff time. Foley also mentioned that she will be having "office hours" at City Hall from 10 a.m. - 12:00 p.m. beginning Friday the 13th. Uh, oh! Two items were pulled from the Consent Calendar - Items 3 and 4. The remainder were passed on a 5-0 vote. Public Hearing #1 is an Urgency Ordinance dealing with Marijuana. Interim Development Services Director Jay Trevino presented this to the council. The request will, if passed, give the staff time to determine how best to implement Prop. 64, passed on November 8th. It requires a 4/5ths approval. The council passed it, 5-0. The staff will return on the February 8th meeting to ask for an extension so the issue can be fully vetted and proper procedures for the implementation of Prop. 64 can be created. 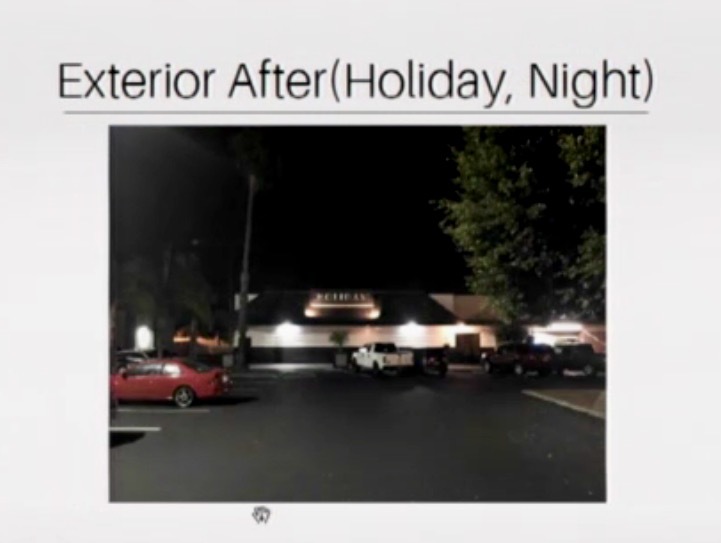 DE NOVO HEARING FOR "HOLIDAY"
At 7:11 p.m. the council began hearing Public Hearing #2, the de novo hearing about Holiday, the lounge/club on the Westside of town. Much controversy has existed regarding noise bleeding into the neighborhoods adjacent to this location. I mention the start time because it took until 9:54 p.m. for the discussion and considerations to finish and a vote taken on the issue. I'll give you the shorthand version. Following a staff report by Principal Planner Minoo Ashabi the applicant's representative, Karen Martin, and her team made a long, very detailed presentation. 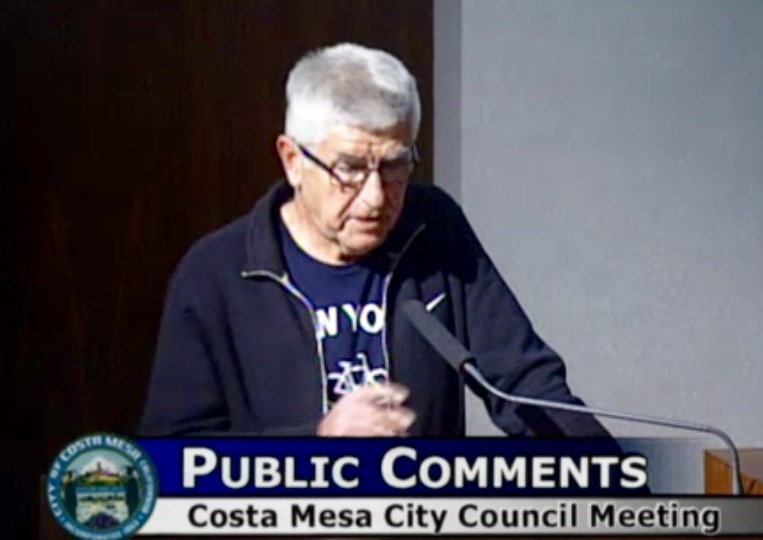 They spoke about having had two sound firms dealing with the issue, the most recent of whom was Gary Hardesty, the man who worked the noise issues at the Pacific Amphitheater. Twenty-eight people spoke on this issue - a dozen in support and the remainder against. 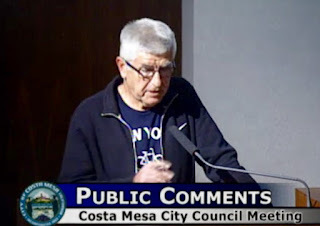 Among those speaking in favor of this operation was Tom Johnson, former Daily Pilot Publisher, current radio host and President of the Costa Mesa Chamber of Commerce. 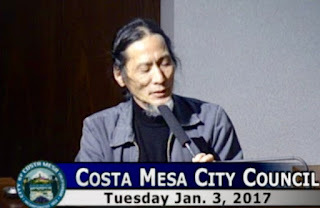 The main opponent of this operation was resident Steve Chan, who lives closest. Following a long negotiation with the applicant, using Hardesty's expertise, the council finally voted to approve the request for live music with certain conditions - modification of hours of operation and a review in 6 months. The vote was 4-1, with Righeimer voting no. An interesting sidebar - during this nearly 3 hour discussion he said not a single word. Methinks he may have been playing Angry Birds on his smart phone. Foley called for a break and they reconvened at 10:06. Public Hearing #3 is the consideration of the current Citywide Traffic Impact Fees, which have not changed for eleven years. 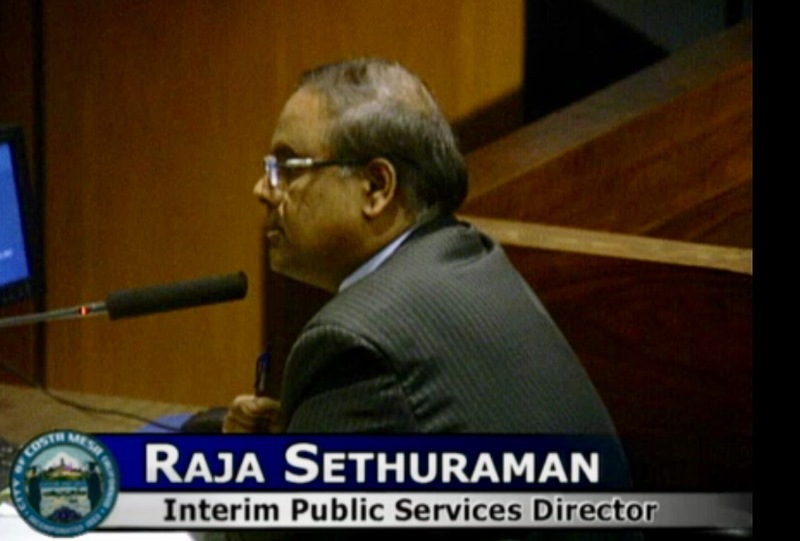 Interim Public Services Director Raja Sethuraman guided the discussion, which included public input from resident Rick Huffman, who wondered why we've never seen comparisons on what other cities charge, the council approved the measure - to retain the current rate of $181 per Average Daily Trip, but asked for a study to be done to include other cities programs. The whole thing took four minutes. New Business #1, a new ordinance amending the city codes to change the title of CEO and Assistant CEO to City Manager and Assistant City Manager. Ashley Garcia of the City Manager's office made the presentation. Four members of the public spoke on this. Jay Humphrey thanked Foley from bringing it forward. Beth Refakes wondered how much it will cost. Robin Leffler applauded the change, citing that it was appropriate and that returning the title to City Manager more clearly describes the job. Karl Ahlf also supported the move. Foley asked Garcia about the costs.. the number was nebulous - she said less than $5,000. Further discussion determined it was probably closer to $2,000. Jim Righeimer spoke against it - no surprise there, since this stupid "CEO" idea was his in the first place. He gave a "little history", which was a rehash of his philosophy that got us this mistake in the first place. The poor, pathetic guy just doesn't know how to operate when he doesn't have guaranteed votes on his side. The council passed the resolution on a 3-2 vote - Mansoor joined Righeimer voting no. Next came New Business #2, which changes the order of the way business is handled during City Council meetings. This change is overdue and corrects the onerous policies of the previous administration which effectively stifles public comments. It changes the start times for Closed Sessions to 4:00 p.m. and the regular council meetings at 6:00 p.m. Five members of the public spoke to this issue, all of whom supported it. There were no public speakers against the change. Karl Ahlf, Steve Chan, Beth Refakes, Jay Humphrey and an unidentified woman all supported it. 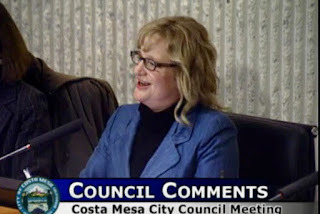 Chan asked if, and when, it is appropriate for a member of the public to present a challenge to a council member being recused from the discussion of an issue. Refakes was concerned about having residents wait until the end to hear a response from the council to their earlier comments. Mansoor moved that the item be approved except that the Council Comments should immediately follow Public Comments - like is it now. Righeimer seconded Mansoor's motion, then gave "a little history" - blaming the change to place the Consent Calendar items at the end on - ta, da! - the unions! He said they pulled every single item during negotiations so he - his majority - retaliated by moving all pulled items to the end of the meeting. What a petty, vindictive jerk he is! And, of course, what he said is NOT TRUE! He then went on to say "That's not gonna happen any more because this majority will give the public employees whatever they want." 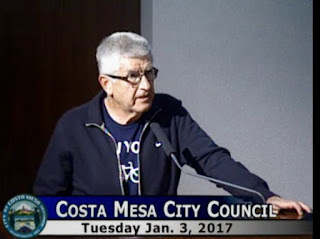 Then he went on about the Public Comments, indicating that it was changed to trail commentors to the end after 6:40 p.m. because all people did was stand there and give critical comments. He then said, "That's not gonna happen anymore. I'm not worried. People in TV Land can't see this right now, but it's pretty sparse in here already tonight.. But, clearly, and the mayor's basically said it, she wants to silence the minority here. She's saying that I want you to speak at midnight." 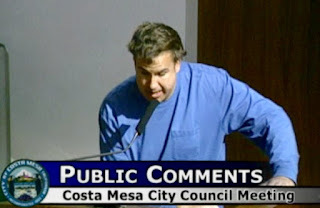 Well, the plan was for ALL council members to speak at the end of the meeting - not just this whiny buffoon and his not-too-bright sidekick. He went on to read a letter for loser Al Melone - the guy who finished dead last in the most recent election. It was pathetic! Eventually a compromise was reached. Council Comments will continue to follow Public Comments at the beginning of the meeting, but individual council members will be limited to four (4) minutes at that time. They will also have a time at the end of the meeting to expound at length on any subject they wish. CEO and City Attorney comments will be trailed to the end of the meeting. It passed, 5-0. 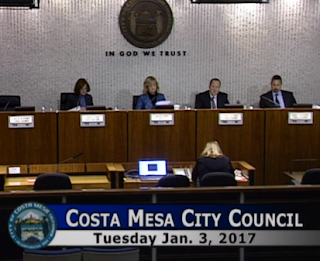 At 10:45 they began to discuss New Business #3, the Release of Commissioners from the Planning, Parks and Recreation and Senior Commissions and a recruitment will be conducted to fill those positions from January 4th to January 18th. A special meetings on January 24 and January 31st to interview and appoint new commissioners. Sandy Genis asked Trevino if there were any items on the Planning Commission agenda that would be deemed approved if not heard soon. The answer was no. Nine members of the public spoke to this issue. Steve Chan asked that the new districting scheme be considered during this process. 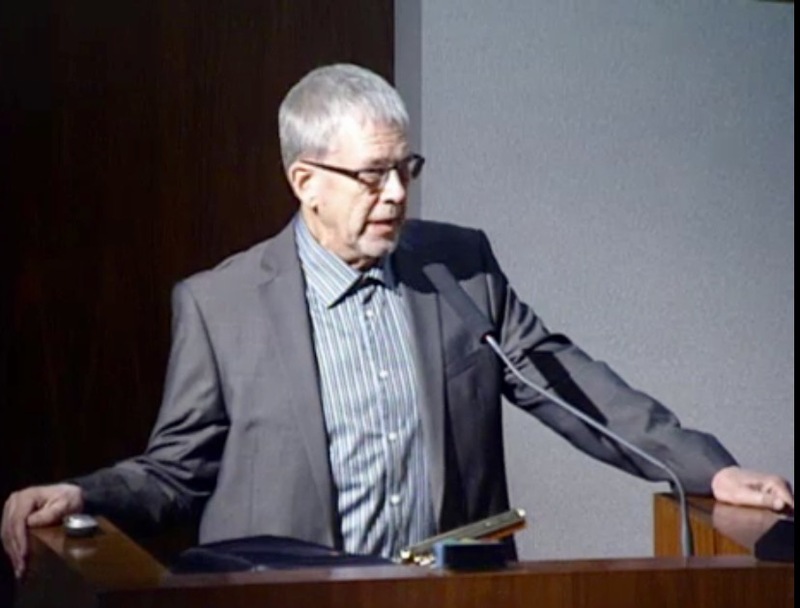 Rick Huffman suggested that it's an opportunity to get new blood from different parts of the city, while acknowledging that having some experience on the commissions is valuable. 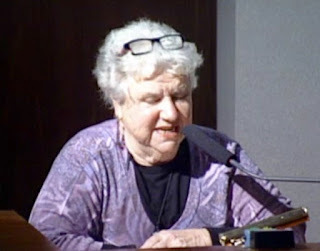 Flo Martin disagreed with cleaning house, suggesting that the normal process should continue. Beth Refakes had concerns about wiping the slate clean. She presumed there would be staggered terms. She said just let the ones expire in 2017. She also questioned the need for a Senior Commission. Gary Parkin, a member of the Senior Commission for two months, is concerned about "losing his job". Robin Leffler thought a sweep of the commissions is a good idea. She said it is traditional. Current members can re-apply. She observed that the last couple of cycles have been brutal, when the council majority made it clear that they were chosing sycophants. Elaine Chan suggested that balance is best. Cindy Brenneman agreed with the idea of starting over with the commissions. She jousted with Righeimer, observing that he hand-picked his commissioners. It's time to clean house. 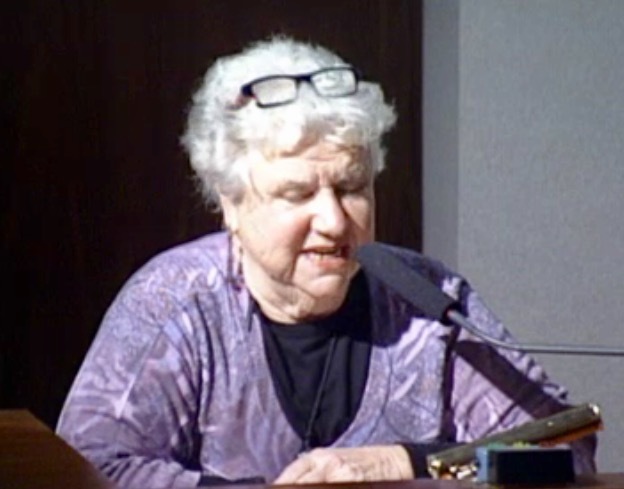 Arlis Reynolds, a relative newcomer to council members, thought it was interesting. She encouraged more engagement by residents. She suggested an evaluation criteria. Ralph Taboada agreed with Reynolds. 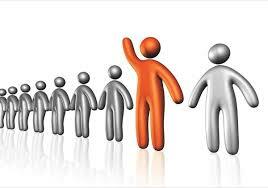 Get qualified people... a diversity of people, both in location and thought. 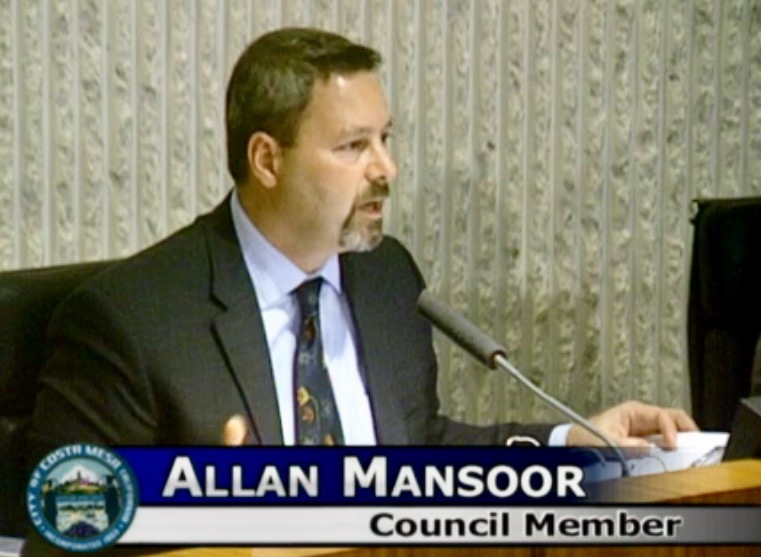 Mansoor said it's important to have experienced people. He said every council has a right to choose its commissioners. He said it's unprecedented. He moved to let the terms expire naturally. Righeimer seconded. Righeimer said that we're firing people. He said he and Steve Mensinger met with everybody they didn't already know in the process. He said there's no reason to wipe everybody off. Stephens said he won't support the motion. He said let's "get the right people on the bus." He said "I want the most qualified people." He said we owe it to the community to open it up. He wants a qualified, diverse group of commissioners. He offered a substitute motion, to release the commissioners and council members can nominate up to 3 people from the pool of applicants, including current commissioners who wish to apply. As mentioned above, there will be two special council meetings - on January 24th and January 31st - at which candidates will be interviewed and selected. There will be NO commission meetings this month. The item passed on a 3-2 vote, with Righeimer and Mansoor voting no. 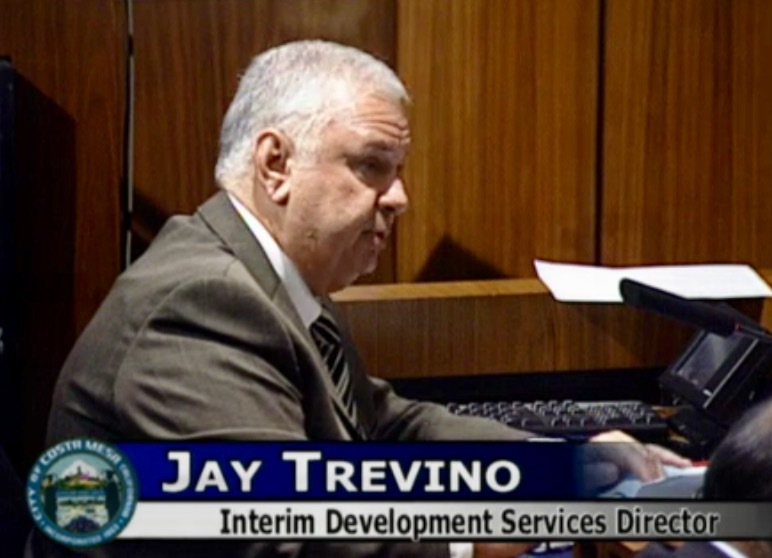 New Business #4, Fire Station #6 and related staffing issues, was next up - at 11:35 p.m.! Fire Chief Dan Stefano presented this issue. The plan is to keep our newest, most modern, fire station - #6 - the Metro Station - open and operating without overtime. The plan calls to staff it with three Fire Captains and three Firefighters. Currently the CMFD has eight (8) openings. This would create six more, for a total of 14. Recruitment is a slow process today because of the demand for firefighters throughout the state and our region. The three Fire Captain positions would be filled by internal promotions, leaving vacancies for three firefighters. Much discussion revolved around hiring new firefighters under the PEPRA program - less lucrative than the classic program. 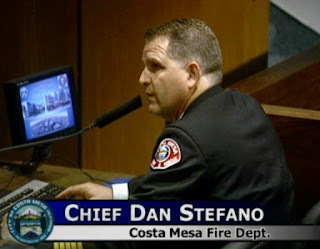 Stefano told the council it is unlikely there would be any recruitment of "classic" firefighters - that all the new ones would fall under PEPRA. Not surprisingly, Righeimer fought this proposal, saying that it was "political payback" to the firefighters for supporting the new majority in the last election. If I was Chief Stefano I'd be fuming right about now. Once again, Righeimer demonstrates his hatred for public employees of any ilk. Mansoor joined him in opposing the item, saying it should have been part of a Study Session. Ah, but we haven't had a study session in years because Righeimer controlled all political thought in the city - until the last election. Righeimer suggested that the Orange County Fire Authority should take over Fire Station #6. He told Stefano it was a good thing he wasn't asking for 12 positions! Again, we saw a pure jackass at work. 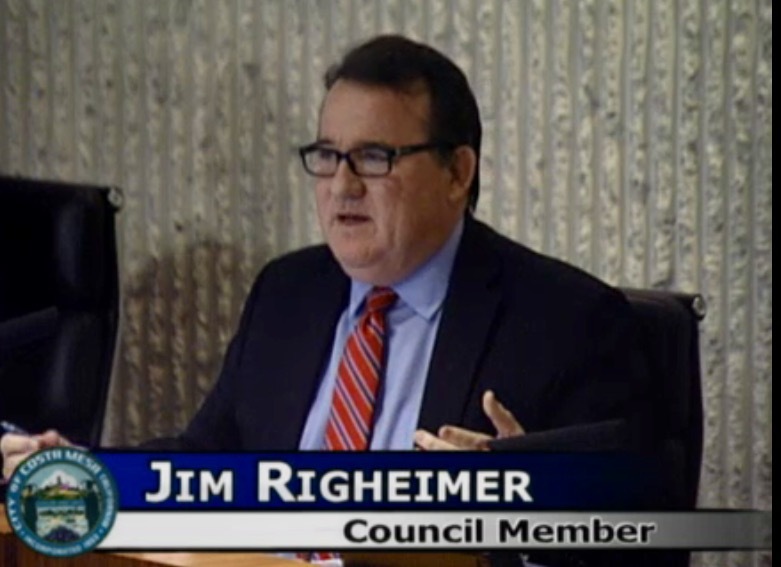 The council approved the proposal on a 3-2 vote - Righeimer and Mansoor voting no. That vote was taken at 12:15 a.m. this morning! The trailed Consent Calendar items were heard at this time. Item #3, the minutes, were sent back to the City Clerk to clarify the language in the minutes. Resident Robin Leffler pulled it and suggested the language did not actually reflect what happened. The minutes will be reviewed and returned. 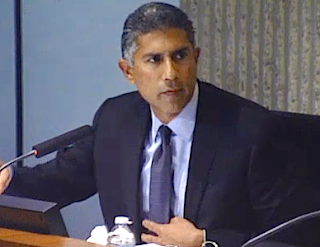 Mansoor and Stephens abstained from the vote since they were not on the dais at the meeting. The person who pulled Item #4 had left so the council passed it on a 5-0 vote. 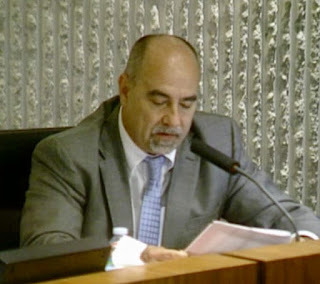 In his report Contract City Attorney Duarte said there is a litigation log being prepared to help with transparency on legal issues currently being handled in the City. 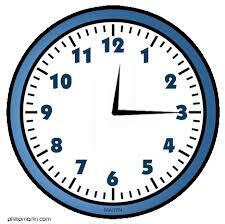 The meeting was adjourned at 12:19 a.m. to January 17th.